add a magnetic strip to the back? add a magnetic strip to the back? (required)Yes please! (+ £1)No thanks! add a magnetic strip to the back? (required)Yes please! (+ $1.82)No thanks! add a magnetic strip to the back? (required)Yes please! (+ €1.18)No thanks! add a magnetic strip to the back? (required)Yes please! (+ $1.45)No thanks! 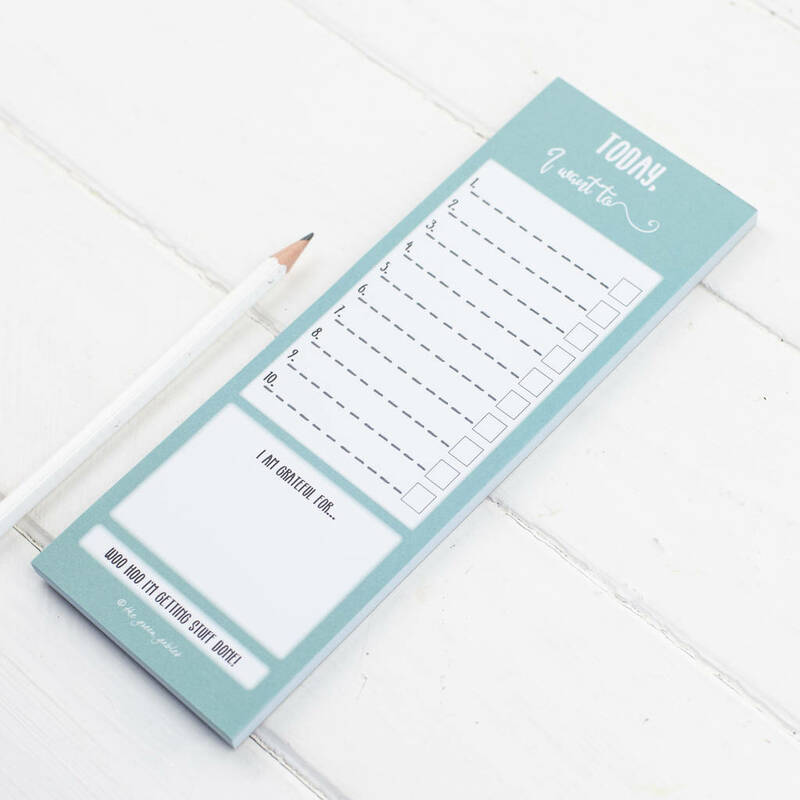 Eye-catching 'I want to' list notepad- perfect for keeping on top of little jobs, or to help you focus on areas of personal happiness. Who doesn't love making a list? This To- Do or (less aggressively) 'I want to' list will become an invaluable companion for you to keep on your desk, in your bag or even on your fridge. The numbers help you to keep count of how much you need to get done and the tick boxes will give you a lovely sense of satisfaction when you get the job done! And yes, don't worry we all sometimes add something on just to cross it off. The 'I want to' list also features a gratitude section at the bottom to help you to focus on the positive, with space to jot down all the things you are grateful for. 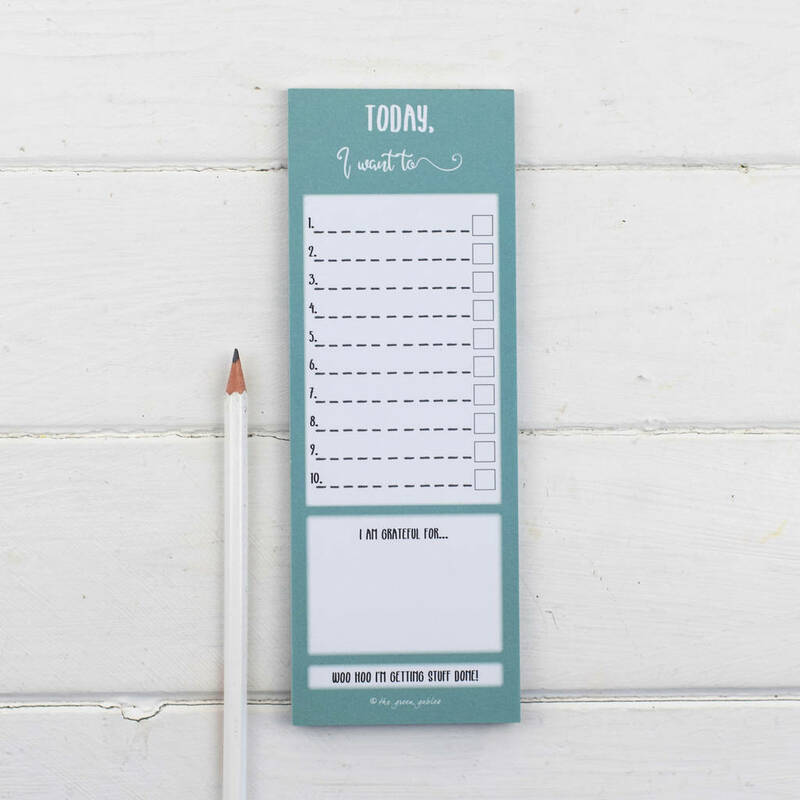 Plus, you have the option of adding a magnet strip to the back of the note pad so you can stick it somewhere handy like the fridge. The soft green designed notepad has 50 pages which are printed on 100% recycled 100gsm paper with a recycled back board in the UK. Your note pad will be posted wrapped in a biodegradable cello bag inside a padded envelope to ensure it arrives in perfect condition. Each note pad is printed on 100% recycled paper. Each note pad measures approx 21cm tall x 7.5cm wide.